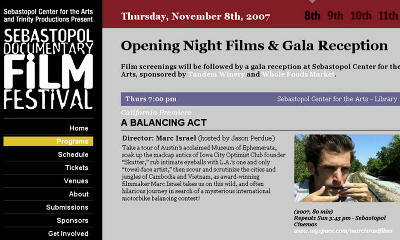 Caption The mission of the Sebastopol Documentary Film Festival is to showcase strong independent documentary films. Additional goals of the Festival are to: * Bring together the local film community. * Develop a strong Latino film program to showcase work representative of the large Latino population in Sonoma County. * Develop a strong youth program for local children and teens to experience the art of independent filmmaking. * Become a catalyst for educational and other film programs such as monthly film screening s and salons showcasing other genres of independent film including narrative and experimental work.